Yep, a stripe dress twice this week. I can't even apologize for it. What can I say? Stripes for the win is all I got. In my opinion, they provide the perfect blank canvas for so many styling options and have many fashion faces; classic, preppy, chic, edgy and even glamorous. I am sure I left off a million other adjectives that describe this pattern we all seem addicted to. They can do no wrong when it comes to clothing. This Ruche dress was another Labor Day purchase. I saw a similar one at J.Crew Factory, but once I finally decided to pull the checkout trigger, it was gone. So when I saw this one online, I added it to my basket immediately. It's another early fall staple that is helping to ease me into the seasonal transition. I hope everyone has a great weekend. I am off to join my neighborhood girlfriends for our 2nd annual wine festival trip. Grape stomping here we come! That dress is a gem I regret not getting the J.Crew one, you look so so cute. Have a great weekend girly. So glad you posted this, I've been spotting that dress or a similar one all over and have been dying to know where I can get one! Those pockets are so cute!! Really wish I had this versatile dress in my closet! :) Happy weekend! LOVE a striped dress. Love a striped anything really! I got one from Piperlime last month, and I've only worn it once so far. Time to pull that baby out again! Love this outfit. The dress is awesome and the boots tie it all together wonderfully. Super cute! Keep the stripes coming!! I'm a huge fan :) And the gold pockets??!?! Shanna!! I LOVE those!! There something about navy stripes that I love. Great dress. This dress is adorable - and I love the flirty ponytail too...perfection! Stripes are so perfect for right now. So jealous of your girls trip! Have so much fun!!!! I can't get enough stripes. This dress is adorable, and I love the pockets! Those pockets absolutely MAKE this outfit!!!!! Absolute perfection dear! I need a pair of booties like those, they are exactly what I've been looking for! I love this dress and have been crushing on it every time I keep seeing a similar version! It's so cute. Love this dress, it's amazing how many striped items we can accumulate isn't it?! Love them! This dress is so simple and fun, I love it! I really like the big front pockets! Oh my gosh.... this dress is WAY TOO CUTE! You really can't go wrong with stripes! also, i would love to know how you stack bracelets- you always do such a fantastic job! You're right you can never go wrong with stripes! You look so chic! One of my favorite looks of yours! Love stripes this season. Those booties are super cute! I love a simple dress and you just can't go wrong with stripes. I say you can never apologize for a great striped dress! Love! I keep seeing this dress at boutiques and I really want to add it to my closet. There is no such thing as too many striped dresses! Omg that dress is too cute! I can never ever get enough stripes. Half my closet is striped. So adorable! Have a great weekend! Such a great dress at a great price! Love it! Funny, I tried on/was about to buy the J.Crew Factory one!! 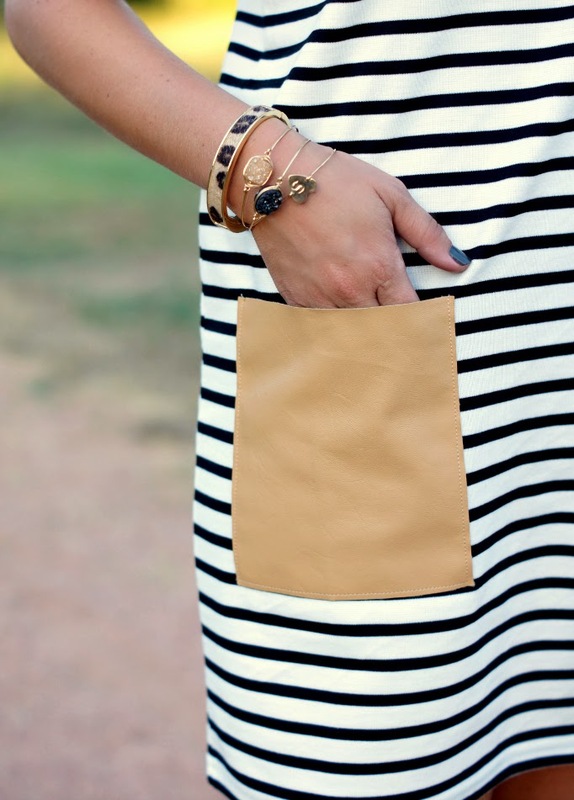 But I love how the pocket is a different color on this one :) Love how versatile stripes are! Love the dress Shanna! 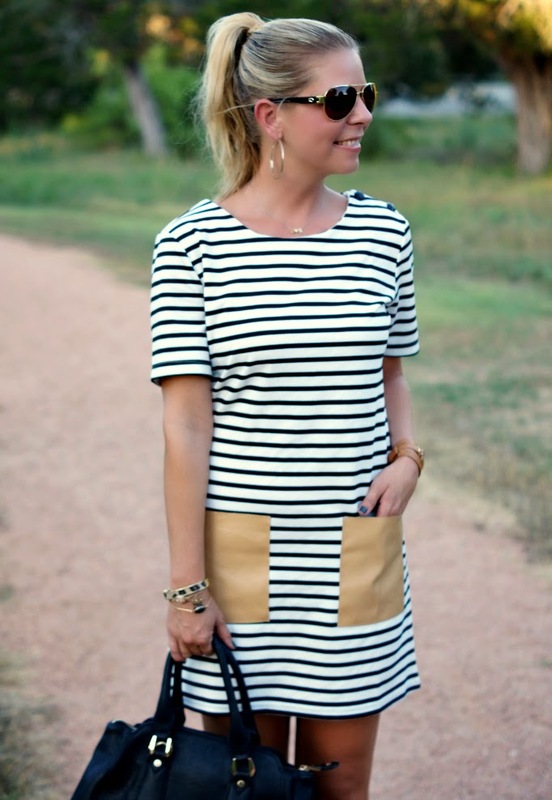 The pockets really make this striped dress stand out from anything I've ever seen! Thats a stunning dress and i love the pocket details. 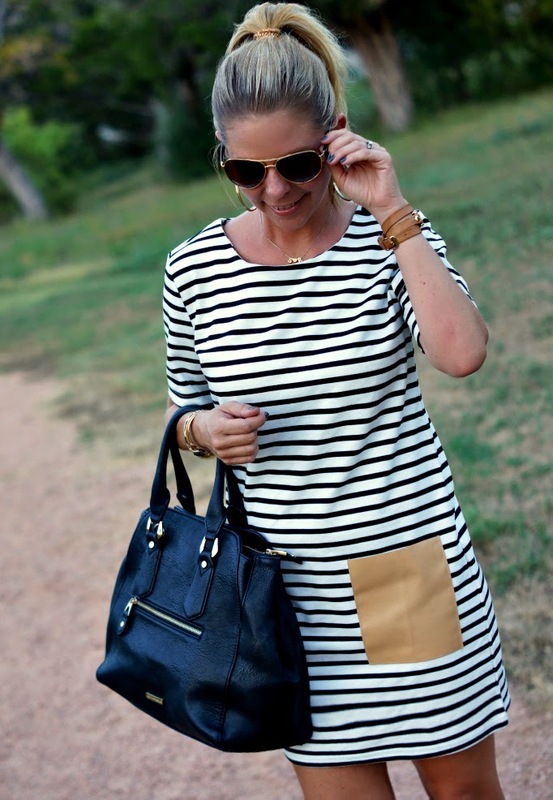 This striped dress is simply adorable! I love the pockets! Aww! I really love your dress! It's so chic and sophisticated! That dress is so cute! It actually reminds me of one I bought my daughter for back-to-school. I think it's the shape. In love with this dress! Especially with those booties. Such a fab look! Very cute! I like the booties with it and the contrast of the leather pockets. This dress is too cute!! I love stripes so much!